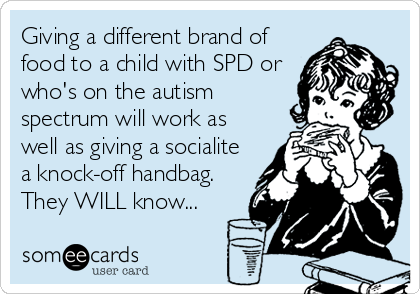 Sensory issues are very common for people on the autism spectrum. Those of us who aren't on the spectrum generally take the input we get from the world around us for granted until something is drawn to our attention - for example, a breeze blowing something that makes a clicking sound might keep us awake. Otherwise, we can filter out the "excess" information to where we aren't consciously aware of it. For autistic people, those filters that "tone down" the excess information don't work the same way, or consistently, or at all. The input from the world is processed in a much different way. Here are some perspectives from autistic adults which may help you better understand what it's like to have sensory issues and the results of those (yes, picky eating is related to sensory issues!). ".... Some other apt examples of proprioception at work: close your eyes and touch your nose. Could you find your nose? What would it feel like if you couldn’t? Close your eyes and raise your arms in the air. Where are your arms? What if you could not tell? Imagine a pinata just in front of you. Now, place the blind fold and spin and spin – how easy is it to find the pinata? Would you enjoy that feeling when you were not playing a party game? Would you like to feel that way while stepping on an escalator? This is a perspective of what it feels like for an autistic person with sensory sensitivities to go on what most of us would think of as a routine trip - a visit to Walmart. If you have sensory sensitivities yourself, do not watch this video. Why do autistic people stim? There are many reasons why autistic people might engage in self-stimulatory behaviors. In this post, I will discuss some of the main reasons autistic people stim. "I remember with fondness my institutional social worker and some of my favorite aides who began group therapy sessions with a handful of girls on my ward. The topic was often the same – FEELINGS. "...The equipment is designed to help stimulate their senses to help them work better, says founder Jay Perkins. "They know it's their space. There's not a competitive nature to it, not trying to do something better than the kid next to you. The pressure is off." Sensory Overload and How to Cope, a slideshow by Chavisory. · Recognize the symptoms of overload. · Remove yourself from the situation. · Reduce the stimulus causing the overload. · Relax your body and calm yourself down. · Rest yourself as you will most likely feel fatigue. Autistics and new foods. We sniff. We scan. We ask “What’s IN that?” We may even poke it with a fork or touch it first. I’m more than certain our inability to hide our emotions makes for some great faces during all of this sniffing, prodding, and inspecting. Since feeding involves all sensory systems (sight, smell, sound, touch, and taste), eating is the most difficult sensory task that children face. Feeding issues are especially common in children with autism, including those with Aspergers, because of difficulties with sensory processing. In many cases, this leads to eating challenges at mealtimes.